Stir fry or curry, however okra aka bhindi and potatoes works wonder together, one of my recent trial with these both vegetables turned out absolutely yummy. This sabzi goes for simple ingredients with few spice powders, and i went for microwave oven cooking for making this fingerlicking curry. Microwave cooking needs patience but you doesnt need to stay next to your oven as we do if you are cooking in stove top. Once the cooking time gets finished,your dishes will be ready to have, actually i love preparing foods through microwave oven, i know some are using their microwave oven just for reheating but trust me you can make varieties of dishes with this kitchen gadget. I have prepared couple of dishes with my microwave oven and still i cook my basmati rice through it,since ever i have started cooking basmati rice through microwave oven i get prefectly cooked basmati rice. You know i can talk for hours about microwave cooking, actually you can prepare a Royal feast with it. 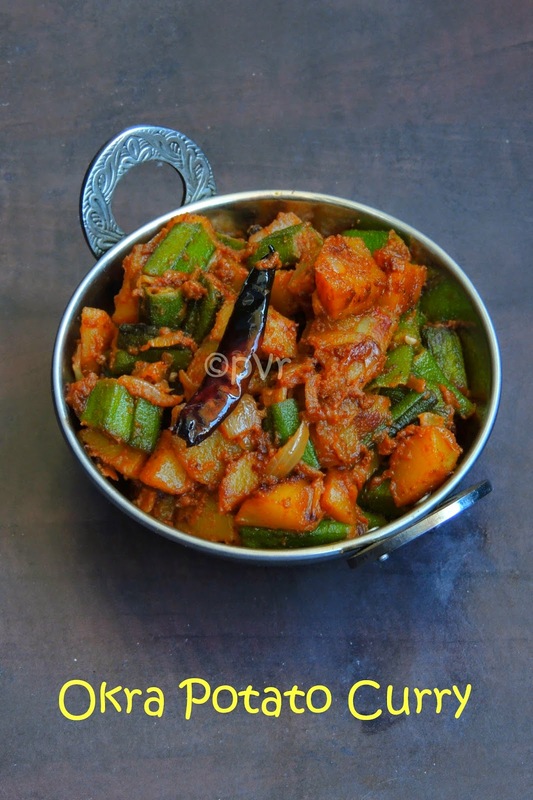 Today's post is my last post for this week's blogging marathon, you might have already noticed that am cooking under the theme cooking with an alphabet, after K, V today post's name starts with O thus am posting this Okra potato curry. This week's theme also goes for different cooking method, after baking and stove top cooking, my today's post goes for microwave cooking. This curry takes hardly half an hour to get ready,doesnt need constant stirring, actually you doesnt need to keep an eye while cooking this dish through microwave oven. Microwave cooking time varies according to the power of your own, while cooking dishes like this its better to use the full power of your microwave oven.This curry goes to Vegan Thursdays. Check out the Blogging Marathon page for the other Blogging Marathoners doing BM#41. My fav recipe.. looks great,..
Bhindi aaloo is one hit combo and we all like it. Cooking in a M W is a great idea and one saves lot of time and you have made the dish perfectly ..looks wonderful. Oh yumm,,, love this combo. Aloo and bhindi make a wonderful combo.. sabzi looks delicious..
Never combined okra n aloo, should try it sometime..and making it in MW is such a time saver..enjoyed your series priya..
My all time fav , love it ...looks the tempting ! Oh yumm pass some rotis please. the combo is ultimate,during my training only saver is these veggies. never go wrong. Have never tried this combo...it looks very delicious. looks yumm.. my kids fav. 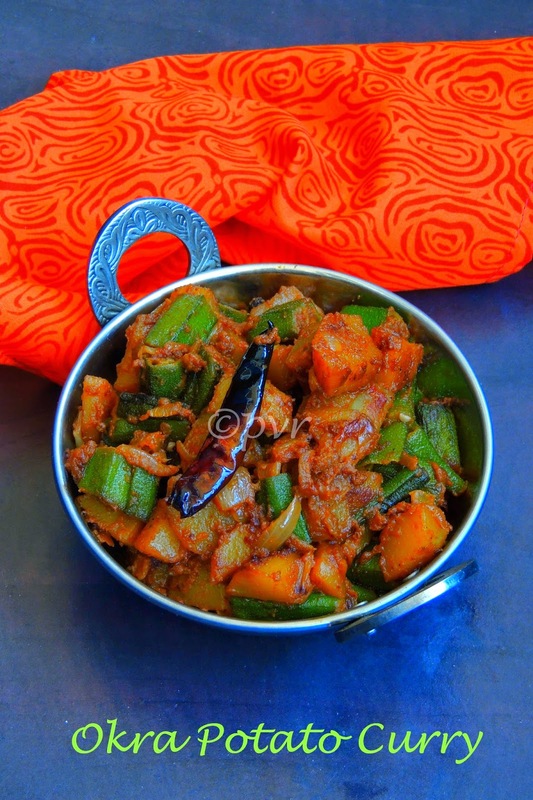 Love this super combo of Okra and Aloo!Tempting recipe. wow orka and aloo definitely a must try, R would love this aks. yummy with potatoes,perfect to have chapathis !! looks delicious, and love the kadai! The curry looks spicy. Like u said even I have started cooking in microwave these days. My rice gets done in 10 mins & Pulav too. It's really a big time saver. But now sure how healthy is microwave cooked food. That is one yummy looking curry and love the potato, okra combination. I am one of those people who uses their microwave mostly for re-heating food. Microwave Potato okra curry looks very good. What a vibrant color! Not a fan of okra but that color would tempt me to at try the potatoes. That is a super hit combination, Priya! !